In this first of four installments, he analyzes the 2018 election results that registered Polk County’s highest Democratic vote margins in history. With the electric combination of strong candidates and suburban party machines, four statehouse seats were flipped and Cindy Axne was elected to Congress. 2016 was a baptism by fire. After Barack Obama’s victory first in the 2008 Iowa Caucuses, then in the 2008 general election, and again in 2012, Donald Trump won the state of Iowa in 2016. And he won it big. After an exceedingly difficult 2016 Caucus and County Convention, Polk County remained divided well after the national campaigns moved on in 2016. As that year ended and as 2017 began, the Polk County Democratic Party ushered in new leadership, as did dozens of other counties across Iowa. We had to rebuild a volunteer base and dig ourselves out of significant debt. To help with both tasks, Senator Tom Harkin graciously gave us permission to bring back the Steak Fry. National leaders joined us, helping draw in new faces and get media attention. 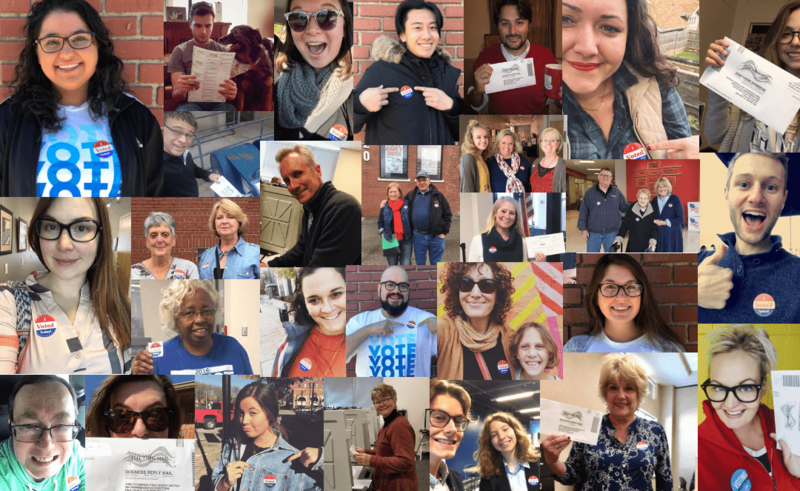 Those new faces helped organize our biggest midterm caucuses and welcomed more than 1,000 attendees for our biggest county convention in 2018. We soon hit our highest fundraising numbers in history. Our volunteers’ efforts helped win back a Democratic advantage in voter registration for the Third Congressional District. Our monthly Central Committee meetings swelled from a few dozen regulars to well more than 100. Many of our successes were written off as luck or chalked up to a favorable political climate. The real test for Polk County, though, is always the top-of-ticket margin – how many more votes the presidential or gubernatorial candidate gets here to provide a buffer for more conservative counties around the state. The pressure on Polk to deliver was especially pressing in 2018 as a test for those new faces that were now in charge. Were we all about high profile guests and fundraisers, or could we put our money where our mouth was? A typical top-of-ticket vote goal for the Polk County Democrats is 30,000. Twenty thousand was enough to help Tom Vilsack become governor, and Barack Obama set a record of 32,369 in 2012. Even though this was not a presidential election, our goal for 2018 was an ambitious 33,000. We ended up with a whopping 37,784-vote margin. Because of that, we held every incumbent seat in Polk County, elected Cindy Axne to Congress, and flipped four suburban statehouse districts from red to blue. Many Third District counties also improved their vote margins this year, although Polk is the only county in the district where Cindy Axne actually won a majority of the vote. Without Polk County’s high turnout, she would not be in Congress this year. How did we do it? By doing nothing that was really novel in any way whatsoever. Our techniques were all standard practice – what Neal Smith would have recognized when he and Lex Hawkins helped lead the Polk County Democrats in the 1950s. Call it “old school” or anything else, but we embraced entirely conventional political strategies. That, combined with the infectious energy of the year, is what helped us blow the doors off the 2018 election. The infectious energy came from several sources. For starters, we had exceptional candidates running for office in Polk County. Like many other counties across America, we were lifted by the amazing women running for office under the Democratic banner. A majority of the candidates for competitive seats in Polk County were women and we were certainly a better operation because of them. House candidate Jennifer Konfrst chased House Majority Leader Chris Hagenow out of Polk County. He literally moved to Dallas County to run for a recently-opened seat that looked easier to win. She won his old district by a jaw-dropping 16 points in Clive, Windsor Heights, and West Des Moines. Kristin Sunde beat prominent and well-funded Republican Peter Cownie by 8 points in West Des Moines. Heather Matson beat longtime legislator Kevin Koester on her second try in previously-Republican Ankeny. Karin Derry beat Jake Highfill in Johnston and Grimes, despite a 2,300 voter registration advantage for the Republicans in the district. I was on a Sunday morning talk show a few weeks before the election and was asked what the surprise of 2018 would be. My answer was that Karin Derry was going to win. I had a bunch of people call and tell me that I’d made a fool of myself on television. If you saw the kind of operation that Karin and her team of volunteers had put together, though, it really wasn’t that bold of a prediction. She won by several hundred votes. These candidates were business leaders, Women’s Marchers, foster parents, educators, attorneys, and much more. They brought campaign staffers and volunteers with them, many of whom were also women and relatively new to the process. 2018 was the year of the Democratic woman. 2020 will be the year of the Democratic woman. 2022 will probably be the year of the Democratic woman, too. Thank God. About one-third of the Democrats in Iowa’s 99 counties live in Polk County. Those high numbers mean that no party leadership here can do everything on their own, no matter how creative or well-funded they are. More than a decade ago, Ray Blase and other volunteers started the West Des Moines Democrats to help focus on issues and candidates in suburban West Des Moines. When Ray moved to Ankeny, the Ankeny Area Democrats got started up, too. Since then, similar groups have sprouted up across the rest of Polk County. With the addition of the Grimes Democrats and the Polk City Democrats in 2018, we now have an active Community Group for every precinct in Polk County. Community Groups, formerly known as Neighborhood or Area Groups, cover every precinct in Polk County. While their membership often overlaps with our Polk County Central Committee leadership, each Community Group elects their own leadership, holds their own monthly meetings, and runs their own Facebook pages and email lists. They host their own events and often have their own Political Action Committees registered with the state. The relationship is seamless between Community Groups and the county party. They’re their own entities, but they are recognized by the county party and follow the Polk and Iowa Democratic Party bylaws and constitution. They know the needs of their communities better than a monolithic county party ever could. They can tailor their efforts more directly for their candidates. They can activate volunteers and voters in ways that a single party could only imagine. Justice Louis Brandeis once commented that states were the “laboratories of democracy” within the federal framework of America. 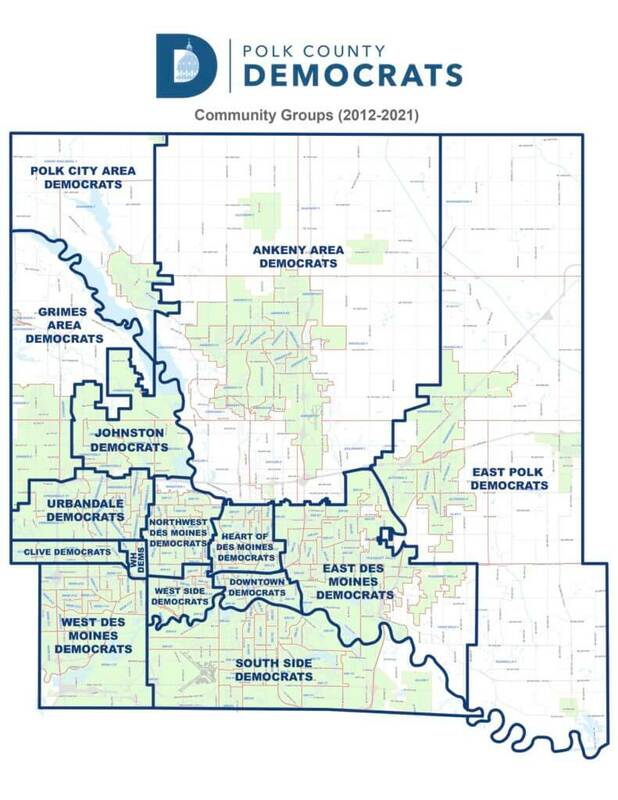 Our Community Groups are the laboratories of democracy for the Polk County Democratic Party. Community Groups are now joined by the Youth Polk County Democrats, which was founded in 2018 by Claire Carstens and other young activists. Their first event focused on voter registration and welcomed well more than 100 people. They have identified student leaders at every high school in Polk County and trained each of them how to register their peers and submit absentee ballot requests. They now often have a regular presence at County Central Committee meetings and at Community Group meetings. This crowdsourced model of organizing has achieved real results. Democrats now outnumber Republicans in suburban Urbandale. Democrats no longer place third after Independents in Ankeny. The Ankeny Democrats were instrumental in Heather Matson’s victory. The Johnston Democrats were irreplaceable in Karin Derry’s operation. Even in the three precincts that are home to the Polk City Democrats, Democratic turnout was up more than 5% from the presidential election in 2016. Although we call them “community groups,” these are really just bigger neighborhood voter programs like the Democratic Party used to do. If two of the national trends for 2018 were that women and suburban voters were swinging decisively toward the Democratic Party, you can start to see why Polk County fared so well. We had suburban machines geared up to help mobilize voters and provide infrastructure as soon as the primaries were over. We had exceptional women running for office in many races. Women flipped all four of the statehouse seats in Polk County. All four of the flipped seats were in the suburbs. The combination of these candidates plus the suburban county party groups was electric. Up next: Empowering volunteers, continuous training, and how to utilize 2020 attention to build a county party.